Back in April the sudden resignation of Sam Hinkie and the immediate hiring of former Suns and most recently Raptors General Manager Bryan Colangelo signaled a drastic change in thinking for the 76ers rebuilding process. Colangelo’s focus on the roster for the near future can already be felt. He added veterans like combo-guard Jerryd Bayless and wingman Gerald Henderson. And of course Colangelo signed Dario Saric. In July of 2015, Stauskas was shipped off from Sacramento to Philadelphia as part of a six player deal designed to clear cap space for the Kings. Stauskas’ rookie contract of just under $3 million was immediately picked up by the 76ers which ends at the end of this season. It remains unclear whether Colangelo will value Stauskas as an integral part of the team moving forward, so the coming preseason may be critical in determining Stauskas’ future here in Philadunkia nation. Now it should be noted that it makes little sense for the Sixers to simply cut Stauskas as they have to pay him that $3million for this year no matter what. However a trade, possibly for a 2nd round pick, (maybe?) is one option. Or if Colangelo simply wants to jettison the disappointing Stauskas from the roster, a buyout and release is another option for the Sixers General Manager. As we all know, Nik’s numbers thus far in his young career are not what you would expect from a No. 8 pick in the 2014 Draft. He has averaged 6.4 ppg. on just under a 38% shooting in his short career. More troubling is that in 24 minutes per night on a team that won only ten games last season he averaged a lowly 8 ppg. ; shot 32% from deep; owned at TS% of 51.7 and an eFG% of 48.3 . 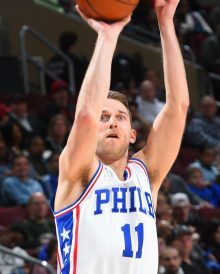 The online “experts” and analysts agree that Stauskas did not have a massive impact on the court for the Sixers, and often ended up hindering the team with his lack of consistency and poor defensive output – a bad sign considering just how little talent the Sixers were able to put out on the floor last season. The additions of journeyman combo-guard Bayless and three-point threat Hendersonserve as solid short term veterans perimeter players who will stabilize Brett Brown’s rotation. Returning starter Robert Covington (35% on threes) and reserve Hollis Thompson (38% on threes) both shot at a higher percentage from deep in the last “tanking” campaign then Stauskas. Adding star in waiting Simmons and a “three & D” player like Luwawu-Cabarrot at this summer’s draft probably will not have a positive impact on “Sauce Castillo’s” playing minutes either. Lastly, Colangelo has also signed a handful of guards off their Summer League roster who, quite frankly, looked better on the court than Stauskas did during his minutes last season and his limited run in Las Vegas this summer (see Brandon Paul). If Stauskas wants to remain a member of Brown’s roster, he needs to step up his game during the upcoming training camp and this preseason. He must shoot the ball more consistently from deep and provide more than the periodic flashes of brilliance we saw in 2015-16 that made him look worthy of his lottery pick. Stauskas is a skilled off-ball mover when he wants to be and has shown a surprising ability to put the ball on the floor, but realistically, the 76ers may now have the depth to overcome some of their prominent shooting woes that the the 6’6 guard could not help solve last season. Colangelo is attempting to move the 7-6 towards a winning future more quickly than Hinkie. Additionally, Colangelo did not execute the trade that brought Stauskas here, so he may not have the patience or loyalty to wait and see if the shooting guard can further develop. Early on this fall if there is not a noticeable improvement in the play of Stauskas, then Colangelo may see no legitimate need for Stauskas to remain part of a crowded Sixers roster and that could make “Sauce Castillo” the odd man out. Follow us on Twitter @philadunkia.